Grevillea acropogon is a prostrate to erect shrub reaching a height of 1.8 metres. Our specimen has developed into a ground cover. The leaves are light green, lobed with a sharp point on the end of each lobe. Flowers are held in terminal racemes and are an eye-catching red. Blooms are rich in nectar and are frequently visited by honeyeaters. Flowering extends through spring. Grevillea acropogon comes from the southwest corner of Western Australia. The species is extremely rare and at one stage the wild population was reduced to 53 plants. In 2009 150 seedlings were introduced to a new site. Our plant came from a nursery near Tenterfield, northern New South Wales. 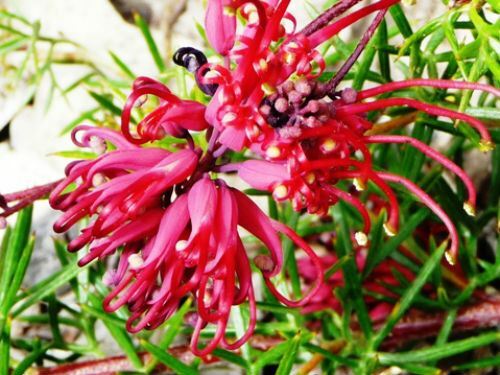 Introducing the species into cultivation and planting in the wild should ensure the survival of Grevillea acropogon. This attractive plant could be cultivated as a foreground plant in native garden beds. Propagation from cultivated plants should be from cuttings because Grevillea acropogon may have had relationships with other grevilleas in the garden. In this case seed grown plants may be hybrids.